After his giant leap last week, with a staggering vote addition of closer to 5500, Navod Paranavithana of Mahinda College has settled in at top position of the All-Island Schools segment, as the 14th week of the Dialog 4G-the Sunday Times Most Popular Schoolboy Cricketer of the Year 2019 contest reaches an end. Navod manages to hold on to the top comfortably while leading Sukhitha Manoj of St. Sebastian’s College Moratuwa by 4448, a further improvement from last week. The following two positions remain unchanged while Nishan Madushka of Moratu Vidyalaya makes a quick progress to fifth from 10th position while Shehan Fernando of St. Benedict’s College gain a slot to the 10th position. 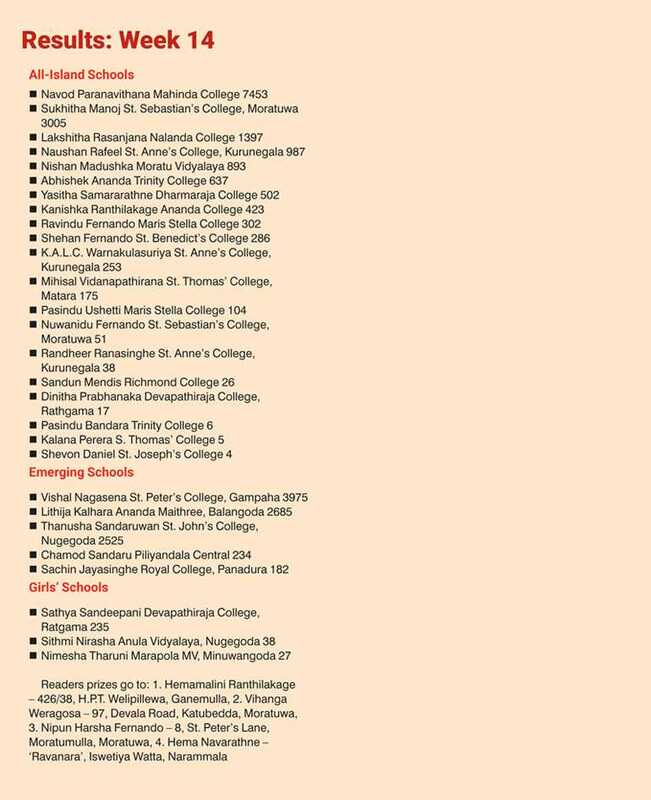 Vishal Nagasena of St. Peter’s Gampaha continues to lead the Emerging Schools category for yet another week while Lithija Kalhara of Ananda Maithree NS Balangoda and Tanusha Sandaruwan of St. John’s College Nugegoda continue to follow steadily. Sathya Sadeepani of Devapathiraja College Rathgama remains as leader of the Girls’ Schools category, which was introduced to the ever-popular competition in the country last season. Coupons will be published in the Sunday Times, the two English dailies, the Daily Mirror and DailyFT, and the two Sinhala dailies, Daily Lankadeepa and Ada and Sinhala Weekend, Deshaya. From this year, coupons will also come out in the Tamil Mirror. In addition, Dialog Axiata’s online voting system through their official Online Portal to vote for the Most Popular Cricketer (www.dialog.lk/cricket) is now live. Online registrations ended on 31 December 2018. Players who have represented their respective school in First XI cricket and with a tally of 400 or above runs or 25 wickets or above in the last season will be automatically eligible for the Dialog 4G-the Sunday Times Most Popular Schoolboy Cricketer of the Year 2019 competition. Schools have been categorised under three categories – the All-Island, Emerging and Girls schools, according to the segmentation process of Sri Lanka School Cricket Association.